First, is your shopping list close to or over £99? If yes, then its a good time to become of a member of the Stampin' Up! crafty family. If you join now you can order goodies worth £130* and only pay £99 (we call it a starter kit) and you don't even have to pay any delivery charge, and next time you place an order you will receive 20% discount. Second, do you want to benefit from a discount when you buy goodies? Yes? Then join now, order your starter kit and then next time you order you will get 20% discount off the catalogue price. What can I put in my Starter Kit? You can choose whatever you like from the catalogue up to the price of £130. If you are new to crafting and have caught the bug then here is a suggestion for a starter kit. If you already have some crafty stash and want to add to it, then that's ok. You can tailor your Starter kit to suit you. 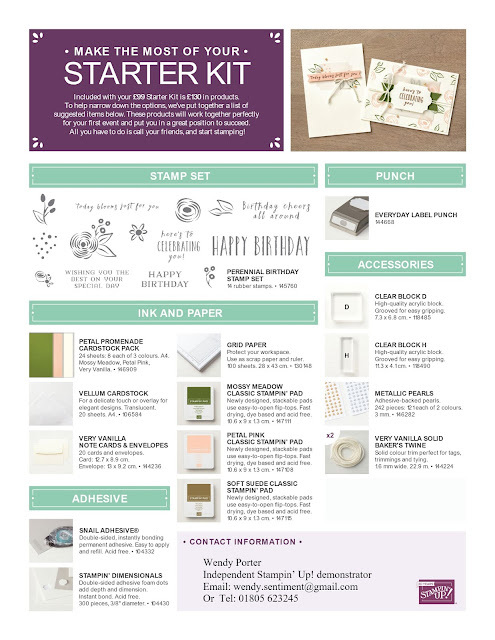 First sit down and decide what you would like in your starter kit, then please click here and you will be taken to the Stampin' Up! Independent Demonstrator online application form, so you can join and become one of my team. The form is quite easy to complete, and the system will prompt you if you've missed anything. Please ensure that my name appears at the top and bottom of the page as the demonstrator you are joining with. Have your debit or credit card and your bank details handy. You will need to confirm you want both the starter it and the business pack (its free, and you don't need to use it). When you get to the best bit, entering all the details of the starter kit up to the value of £130. The system will help you keep track of the value but won't let you go over that figure. If you know the codes, you can enter then add them, or if you click the 'All' button underneath the Search facility, you will see pictures of all the products in the catalogue and from this you can select those you want. This is quite handy, because it also includes products that are in the clearance rack and are discounted, so even more bargains! If you use the filters you can find products within a certain price range, which is useful when you find you have a certain amount still to spend. That's it, just sit back and eagerly await delivery of your goodies, so the fun can start. When you have completed and submitted your form, you will hear from the Demonstrator Support team with your id number and links to the Stampin' Up! 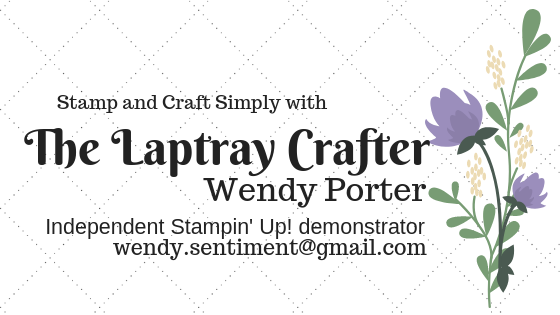 demo website where you can learn more about Stampin' Up! and the online ordering system, where you place your future orders. If you are interested in starting a business, there is lots of very useful information too that will help you do that. But do not worry, you don't have to do this, you can just be a savvy shopper! Do I need to meet a minimum purchase? Yes you do, if you want to retain the discount, there is a minimum of just over £275 (catalogue price) every three months. However, don't forget you will be earning a 20% discount and if any of your orders are over £150 then you will also earn Stampin' Rewards, that is an extra 10%, on the entire order, so straight away you will earn £15 when your order is £150 and then as you add more, the Stampin' Rewards will increase too. Don't forget you can spend this yourself or if you have some customers or crafty friends, they can order through you and their spend will contribute towards your quarterly minimum. In order to meet the minimum sales requirement, qualifying orders must be received by Stampin’ Up! before the end of each Stampin’ Up! quarter. Stampin’ Up! quarters correspond with standard calendar quarters: (1 January – 31 March, 1 April–30 June, 1 July–30 September, 1 October–31 December). When you join Stampin’ Up!, Stampin' Up! offers extra time for you to meet your initial minimum sales requirement. So for instance if you sign up in July, you have until the end of December to make your minimum. So you could be buying at 20% discount until the end of December and then if you don't meet the minimum, you can just 'drop' and you haven't lost anything at all. Of course, I want you to stay and enjoy all the benefits for a long time. But there is no pressure to stay. What happens if I don't meet the minimum? You will cease to become a demonstrator and if you would like more goodies you can purchase them from my shop. Don't worry about returning your starter kit, its yours to enjoy. As well as buying goodies at a discount, when your orders are larger, you will receive extra rewards. These extra rewards become available for orders over £150 and grow depending on how big your order is. When you sign up as a demo, you receive the title of Bronze and will receive 20% discount. Later when you 'advance' to Bronze Elite you will receive 25% discount on your future orders/sales. I can explain how to move to Bronze Elite when you join. Everytime you order, you will earn 'Flex points'. These are a bit like loyalty points that you earn when you shop at a supermarket. These can be used to purchase more goodies, or for attendance at On Stage. You will joining my team of Crafty Piglets, and of course become a member of the worldwide Stampin' Up! family. You will be able to go to On Stage. This is a fabulous event that happens twice a year: in April and November and demonstrators from UK and beyond all meet up and have a brilliant day. watch demonstrations by fellow demonstrators using new products. Craft together.... the best bit ever! You cannot imagine it.... there are usually about 400 of us all in one room and usually we have 3 projects to make... its mayhem, but its also great fun! Don't worry, I am here and can help you. I hope I have convinced you that it really is a good idea to join Stampin' Up! and I would love it if you would join my team. It is very small at the moment, but I am very keen to have you join. I am often asked is there a good time to join. I alwas say now is the best time... you will start to earn 20% on your orders. Throughout the year there are always special deals to entice new people to join, but we don't know what they will be, so join now! I joined Stampin' Up! because I love the products. One of the best features is that colours of the inks, card stock, ribbons and accessories are all colour coordinated. This makes making any project so very easy... if you have been crafting a while, you will know how many shades of red there are. I always found that I could never match everything perfectly, and it really upset me. I like to think that my projects are all made with love and from the heart and to have them spoiled, was so disappointing. Then I found Stampin' Up! Hey presto, that problem I had was gone, now I know I can buy coordinated products; stamps, dies and punches, card and beautiful Designer Series Papers too. I get a discount.... always a nice to have and I can purchase new products before the general public.... oooh... how brilliant is that. There are lots of good things about joining. Stampin' Up! is a family company and there are lots of demonstrators all over the world who are very generous with their inspiration. Don't be frightened, its really easy, if I can do it, anyone can, and you won't regret it. Everyone who joins Stampin' Up! as an independent Demonstrator, does so for their own reasons. I joined, like so many demonstrators, for the 20% discount we automatically receive on all orders. But being a demonstrator is so much more. Every demonstrator is part of a team, and there is always someone who can guide and inspire you. The opportunity to earn cash bonuses, product bonuses and even worldwide incentive trips! receive a magazine that lets you know all that is happening in the Stampin' Up world, plus gives some inspiration for card making and projects... very useful! be part of a team of friendly and inspiring crafters.